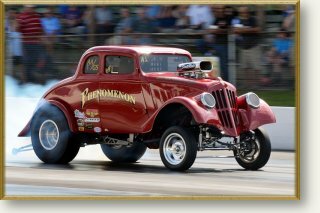 It’s mid October so to many of us that means it’s time for the Goodguys Nostalgia Nationals again. Take a look at the pure blue skies in some of the first photographs below. The day started out cool, clear, and perfect fall weather in our part of the country. I had intended on spending Saturday and Sunday at the track but the weather Gods had different ideas. Despite the perfect weather on Saturday, Sunday had a 70% chance of rain in the forecast. The race director made the [appropriate] decision to run two elimination rounds on Saturday and the remainder Sunday morning so hopefully they got everything in. I already had a motel room so I spent the night in Bowling Green but when I got up I decided I’d rather go home and watch the NHRA Texas Nationals than the remaining 1/4 of the cars run their eliminations, so I headed south for home. I got my “Speed Fix” for a little while though so I’m happy. They year is winding down now, even though it seems like only a couple of months ago I was headed for Phoenix and Gainesville, so only a couple of races left for me. As a side note, since I didn’t see any “Official Photographers” at the race I’ll make this offer: Any of the drivers who want a copy of any of the photographs on this site Send me an Email (I guarantee your email address goes no farther than me) and let me know and I’ll be glad to send you a high-resolution copy of them without my name at the bottom. There is no charge whateoever for them, I’m glad to make them available as my thank you for the enjoyment I get from watching. Notice that I said “Drivers” above and that’s because I can normally match a name on a race car to an email address. I’m not going to send copies to just anyone since there is no telling what they might do with them that you might not like. If you’re a car owner or team member you’re going to have to convince me you have a right to the photograph, or get someone with their name on the car to request it. Also note that I said the photographs on my SITE, not just this page. I normally wait a few months after a major race to make them available to give the so-called “Pro” photographers time to make their sales. Since the last big race I went to was in June it shouldn’t be a problem for anyone. OK, enough of that. The photographs are below. One of the cutest things at the track! NOT one of the cutest things at the track! THE SCENT OF NITRO IS IN THE AIR!! !